How can professionals help their divorced clients practice peaceful parenting at the holidays? Divorce is never simple, but around the holidays it seems particularly complicated. After all, the holidays can be complicated even for intact families. There are extra commitments and obligations, figuring out gift purchases, blending traditions and, of course, deciding where festivities will be held. Though the added stress of the holidays can make divorced parents even more apt to fight, it’s particularly important that they make a concerted effort to be civil for their children’s sake. Why? Because professionals say the way holidays are handled can set the tone for the entire upcoming year. 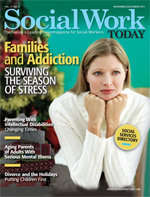 It’s no easy task to make the holidays go smoothly, but it’s an area where social workers can help. Prepare clients for some of the issues they may face and counsel them to practice good communication skills. Like any case, each divorce is a unique situation, and there are no simple answers that can cover every client. However, you can make some suggestions that may ease a newly divorced family into handling the holidays. The first set of holidays following a divorce is likely to be the most difficult because the parents are still figuring out what works—and what doesn’t—in terms of coparenting. On top of that, the wounds from going through the divorce are likely still fresh. But Julie Crowe, LMSW, of the DePelchin Children’s Center in Houston, says even if the divorce occurred earlier in the year and there’s been some time to deal with it, the first set of holidays are likely to still be tough. That’s a key point for social workers to remember, says Crowe. While the children often have the most difficult time adjusting, the entire family is dealing with a sense of loss. Yet even though the parents are likely dealing with plenty of their own issues, the holidays are a time when it becomes more important than ever to attempt civility. This is particularly important because children are more sensitive around the holidays, says relationship counselor Michele Germain, LCSW, LMFT, CBT, author of The Jill Principle: A Woman’s Guide to Healing Your Spirit After Divorce or Breakup. There are plenty of decisions that need to be made in terms of celebrating the holidays under these new circumstances. How will time be split? What traditions will continue? But some of the biggest questions that may arise will likely surround gift giving. It’s an area that parents need to address up front and away from their children—even if that means e-mail and phone communication. This is a topic that can be particularly challenging as finances come into play. Crowe says facilitating better communication is a critical role of the social worker considering there will be issues to discuss throughout the child’s life. Another one of the bigger decisions that may be considered around the holidays is the idea of the divorced parents coming together for gift giving or another part of a shared holiday tradition. Risa Garon, LCSW-C, BCD, CFLE, executive director and cofounder of The National Family Resiliency Center, Inc. in Maryland as well as the author of multiple books, including Talking to Children About Separation and Divorce: A Handbook for Parents, says that before considering this, divorced parents need to put serious thought into whether they can handle it without any major tension or fights. She says it’s also important to have an up-front conversation with the children to ensure they aren’t given a false sense of hope. It’s also important that the parents consider any extended family who may be present. For some families, they may be the ones who cause tension. Germain says these types of situations are why she typically advises newly divorced families to steer clear of getting together over the holidays. With divorce comes a lot of change, and social workers can help guide their clients through the process of accepting that change. Part of that may be developing new rituals and traditions around the holidays, says Garon. She suggests parents have an open conversation with the children about which rituals are most important to them and that they want to be retained. Germain says parents should try to avoid getting hung up on tradition and focus more on creating a holiday that brings their children joy. Parents can also view these new arrangements as a bonding opportunity as they create their own new traditions. Garon says creating new traditions is an area where social workers might be able to help. Social workers may also need to help clients accept that holidays can be celebrated on nontraditional days. If the parents or children don’t want to split the holiday up by traveling between parents’ homes, it may mean that the child doesn’t get to see both parents for the traditional holiday. But Garon says social workers can suggest their clients celebrate at other times in the year. By facilitating better communication, making helpful suggestions for change, and counseling the family through the transition, social workers can play an instrumental role in guiding divorced parents through the holiday season. However, even though clients may need a lot of handholding through the process, it’s important that social workers are careful not to take sides. And while counseling for the whole family is important to help guide everyone through the transition, it’s often important for the parents to get additional support on their own. Crowe adds that anytime the parents’ issues start to overtake a family counseling session would be an obvious sign that the social worker should suggest they seek additional outside counseling.